People will tell you that you cannot even quit the game. All too soon you will learn, "I Can." Learn that suicide is not an option. To quit a game, just say, "I need a break." Do this when you are hurt or remotely tired. Always elect to play again. The only way the world can get any better is by each man or woman living in it. Know this. Dare to live. When your body has had enough, you will be allowed a recess, or to go crazy, if only for a while. Short of that, you will be allowed to take refuge, to rest, to leave, and to go on vacation. You will learn how to survive in your environment. Your body will teach you how to enjoy life. In spite of diversity, dare to live. Others had a job to do, to prepare a place for you. Others dared to live so that you might; others dared to wait, to be proud of you. They were there to pick you up when you fell, to look where you landed each time you jumped, and to be ready to take you back, until you were really ready to leave. The act of suicide can not be understood. You are not to say to the Almighty or to each person who lived for the good each tried to do for you, "No, thank you." Spend your life daring to live. And with yourself, dare to be gentle. A menu card can be used to help to theme a meal, and to add ambiance to an event. It may be used to list courses to be served. It could be used as a guide to the items needed in each place setting: from the last course to the first, and as a cheat sheet for the kitchen. Formally, a menu card is to be in cream or white card stock, and can have a beveled gilt or silver edge. Informally it may be in any color or paper, without an edge. It is to be four to four and one half inches wide, by 6 to 6 1/2” high. It can be written on a blank 4 x 6 index card. It may be no bigger than five by seven inches. In business or in public, a menu card may contain a logo or symbol to center of it. In a home, it may contain a heraldic device, a monogram, or intertwined initials. Each item may be embossed, engraved, or printed. Formally, this item may be printed in a color to match the beveled edge of the card, or in the theme color of the event. For extremely important occasions, a menu card could be engraved in French in script in black ink. For a less formal occasion, the items might be written by hand in calligraphy, typed, or printed. One menu card can be provided for each two place settings, usually at the setting for each woman. Each card may be signed by each guest at a given table, and given or retained as a memento of the event. One card is to be retained by the cook. It is to be used by the host as a reminder of the items not to serve the same people at the next event, unless by request. Informally, a menu card may be printed two to each side, four to a page, on construction paper. 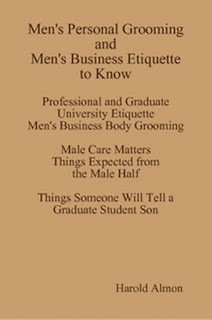 A larger version may be printed one to a page, and used as a kind of sign in sheet. Have some fun with one. Salt and pepper holders are to be placed together. The pepper holder is placed parallel to the visual left of, or at an angle to the salt holder. In homes, individual holders can be placed above each place setting, or above the dessert flatware. Holders are to be placed to the left of an ashtray if one is set in a place setting. Common, large, holders can be placed between and above each two place settings, or in reach of at least one person at the table. In commercial dining rooms, salt and pepper holders can be placed next to the table centerpiece. On like tables, these items are to be placed consistently. In a home, the salt and pepper holders are to be filled each time before being put in use. The holes are to be cleaned routinely. Silver plate (metal) holders are emptied and cleaned after each use. In past formal service, salt and pepper holders consisted of a pepper pot and a salt cellar with a spoon. Today these are just useful creative novelties; if you already have them, use them. It is O.K. if you do not have them. They are placed in the same manner as other holders. The ashtray is placed above the place setting, and/or above the dessert flatware, at the top center of the place setting. In truly formal service it is omitted, or is replaced by one designed and shaped like a flower. The petals may be turned and removed. The body of each petal is an ashtray. The ashtray may be omitted. A party favor is a small (return) gift given to inspire the remembrance of an event – (especially a dinner party,) It can be a gesture of thanks for a gift or attendance. It may be used to encourage one to come back. It could be just an item to add to the frivolity of an event. Sometimes called goodie bags or party loot, it can equal 20% return of the cost of a guests’ ticket. A party favor could be placed next to each place setting. Each favor could be set center the table, and/or provided on the way out. It might be placed under a chair, when it is large or when it is being provided as a surprise. It is intended that each be enjoyed later. It can be an individually prepared rose (something to smell) lain across the top of each place setting, or in the folds of a napkin with or without a ribbon and baby's breath.) It may be a ribbon wrapped boxed piece of cake, a cookie (with or without the fortune and/or a piece of signature candy (something to taste.) It could be a small token from a home city or country, or a past trip or project. It might be a commemorative glass provided with or without a balloon and a little ribbon. It could be provided in or out of a preset bag. A candleholder can be used to hold candles. Each can be a single candleholder surrounded by many flowers, or vice versa, but there are other options. The candleholder is to be placed center the table when it is the centerpiece, for fun. It can be placed in threes at the far edge center of a table. The candleholder may be a carved out artichoke. At a truly formal table, it may be placed in fours: one at equal distance from center the table. Any two-candle holders may be substituted with one candelabrum. Candleholders are omitted from the dining table during the day. They may be seen on a serving table in the daytime. A little water may be placed in the bottom of a China or crystal candleholder to keep wax from sticking. Chill a candle before you use it. Place it in the refrigerator for 24 hours before lighting it. Pre-light the wick before you set it in place. The holder and candle are to provide light above or below eye level. Tall candles can be used in short holders. Short candles may be used in tall holders. (In a commercial dining room candlelight may be substituted by a lamp.) Light the candle before people come to the table. Burn it out of any draft. You can protect your flame in a globe or in a hurricane. Blow it out after people leave the table. You may omit candlelight in entirety. But, where allowed, why try? A fruit holder is to be used to hold fruit that is to be passed or served. It can be placed alone center the table as a centerpiece, or in pairs of both sides of a centerpiece. It may be placed on both sides of a candleholder, placed after centerpiece. It could be omitted.  The current United States of America menu no matter how formal consists of no more than five (four) courses, not counting the passing of after dinner coffee, (as established by the White House.) Learn to eat in courses over eating piles on plates. In informal America, the first item served could be an appetizer. It might precede or substitute as a first course. A trend has developed of serving a three course meal usually consisting of: shrimp cocktail, a salad, and an “Entrée.” “Avoid spending your whole life calling a main course your entrée or eating your “entrée” with the third fork.” In informal America, salad is eaten before the main course, and in extremely informal circles it is eaten before it. And a one plate meal is the reigning game in town. We can do better. The first and the second course can be eliminated. The fifth course may also be eliminated, but, when you have company, do so reluctantly. The menu and items in each course are to be selected based on the symbol of hospitality to be expressed, the suitability to the event, the time of year, and the time and temperature of day the items will be consumed. In selecting menu items, avoid appearing too opulent, insensitive, wasteful, or cheap. Avoid running out of anything. Above all, each menu is to be based on what people like to eat, and on what the cook has successfully prepared on a prior occasion. It is to omit items based on medical, cultural, or religious restrictions of any person to be served. Now, set the menu. The selected menu is used to identify items needed in setting a table, going from the last item to be served - inside out - in kind.  A table is to have chairs that come with it. Chairs are used to add a degree of formality to an occasion. They add ambiance to an event. Chairs can represent a dream come true for people who feel too old to eat standing up or sitting on floors.  Mix and match chair can be gathered in from places throughout the house. Plastic chairs may be spread throughout or stacked in a closet. 1. Place the tie around your neck (Wrap the tie around itself; go up through and down to its back. 1. Start with the large end of the tie on the right side. Wrap it around the back of the smaller end and to the front. 3. Flip the larger end up over the wrapped point and pull it to the back. 4. Switch hands. Pull the larger end tight. 5. Now wrap it around the front to the back of the smaller end. 6. Flip it up and through to the front. 7. Put the tip through the noose at the front top opening. Pull the larger end through the knot, while holding the knot at the bottom. 9. Check the bottom of your tie. The split bottom angles are to meet at the side. There are other knots and notes to know; when you have mastered each, plan on having a Tie Tying Party. 1. Place the tie around your neck. 1. Start with the large end of the tie on the right side. Pull the larger end down until it extends two to four inches below the smaller end. 4. Pull it through the knot while holding the knot at the bottom. 5. Use the other hand to adjust and to shape the tie knot, tie, and dimple. Check the bottom, the split bottom angles are to meet at the side. An Ascot is tied in the same manner as is a Four-in-hand knot, except for the last step. The large end is pushed up and through to the front, but it is let to lie in front of the noose. The clasp on a western tie is to be slid all the way up. A clasp or a piece of jewelry has been seen at the top of more than one neck. Socially, there is that no collar shirt with a top button, it is to be covered with a button cover. 2. Right end: around, up and through, to the front. Let it go. Pull on back end. 3. With the front end, make a bow. Left end up make a backward bow loosely. Feel in back for a hole. Pass through it a backward bow. Adjust. 1. Wrap the tie around the neck so that the larger end is on the right side and two and one half inches below the left end. 2. Wrap the large end around up and through to the front. 4. Next, reach behind the bow. Put an opening between the part of the tie pushed through and the part of the tie wrapped around the neck. 5. Fold the large end up and through to the back. Fold this end into a reverse bow configuration. Push/pull it through the back opening so that the full back bow is in the opposite direction of the front bow. 6. Shape the bow by holding and pulling the middle of the left bow. Ensure that the bows of a bow tie are placed in front of any spread or wing tip collar. Learn how to wear, tie, and enjoy a bow tie. The real joy of this is in undoing it. Near the end of the event, you can undo it. Let it hang from your neck. Better yet, let it hang from your partner's neck. Look around and smile. First, ensure all senior people have left the event. Enjoy your alpha moment. Tie your tie in a knot acceptable to your planned company. It can help sustain the image you are trying to portray. Tie your business tie better. 1. Tie it correctly. Avoid tying it too neatly. Frame it with a high shirt collar, then when among peers you can askew it. 2. Before tying a knot lift your collar up. Place the tie around your neck. Start so that the large end is on the right side. Pull the smaller end down until it is even with your belly button or a lower shirt button. Start to tie your tie high up near your neck in the corridor of the collar. It can give your tie extra length. The tie knot is to complement the type collar of the shirt to be worn. 8. Angle the bottom of the knot a bit upwards towards your chin. Pretend that it just does not matter.There is a knot called the Pratt Shelby. It looks like a Windsor in its finish. If provides for extra length, if you have need of it. It is suited for when you are husky or tall: nice looking knot, more tie. A menu card can be used to help to theme a meal, and to add ambiance to an event. It may be used to list courses to be served. It could be used as a guide to the items needed in each place setting: from the last course to the first, and as a cheat sheet for the kitchen. Formally, a menu card is to be in cream or white card stock, and can have a beveled gilt or silver edge. Informally it may be in any color or paper, without an edge. It is to be 4 to 4 ½ inches wide, by 6 to 6 1/2” high. It can be written on a blank 4 x 6 index card. It may be no bigger than 5 by 7 inches. In business or in public, a menu card may contain a logo or symbol center of it. In a home, it may contain a heraldic device, a monogram, or intertwined initials. Each item may be embossed, engraved, or printed. Formally, this item may be printed in a color to match the beveled edge of the card, or in the theme color of the event. One card is to be retained by the cook. It is to be used by the host as a reminder of the items not to serve the same people at the next event, unless by request. Informally, a menu card may be printed two to each side, four to a page, on construction paper. The line to the table is to lead to a creatively and correctly set table. It can be used to showcase each room, and each cover: place setting, napkin fold, and menu card. The responsibility for a Correct and Creative Table Setting belongs to the Decoration Committee. The line to the table is to follow or replace the line to the bar. It is to sum up everything you want your dining room to be. It is to reflect the thought, care, and personality you put into your event.  A dining table is used to extend hospitality, and to repay hospitality. 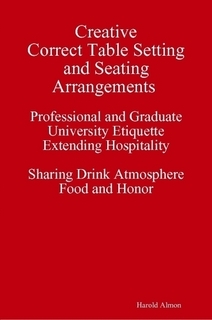 It allows for the sharing of drink, atmosphere, food and honor.  TABLE DIMENSIONS (narrower is better.) When a larger table is wanted, the table may have a custom top cut for it with two hinged halves that fold down, to be placed on top of the table, (and taken off later and placed in storage.) A Folding Table can be put in use and can later be stored on a table dolly. Same size segmented tables can be used alone or stored throughout and joined for events. Station four is to be located in a dining room, living room, or very informally (and rarely) in a kitchen. It can be set in a bedroom pressed into service for the evening, or converted into one in a room in a large home. Each table is to be spaced such that each can accommodate a guest being served at it. At a table for set eight or more, name place cards are to be used to tell people where to stop. Order flowers, it can be just centerpieces or as many arrangements as relevant. An executive host can select a signature flower. You can get just two flowers. One is to be for the bud vase. One is for the petals you may add to the space for effect. 1. Business dress at its best is to consist of anything that was once alive: wool, cotton, silk, and/or leather. 3. Remember to tell yourself to, "Pretend that it really just does not matter." In life, everyone you see that is clothed is not necessarily dressed. Dressing is something to be done to fit in and to still stand out. This is dressing for success. 4. A dress code is to reflect your allegiance to an employment condition, job position, or social association, or to people one level above you. 5. In business, a suit is at the top of the "Dressed" list. This is true, even when all that it is is a uniform. The purpose of a uniform is to increase your authority with or over someone else. A "Uniform" is what someone expects to see. Practice dressing in the uniform of choice for your field and level. 6. 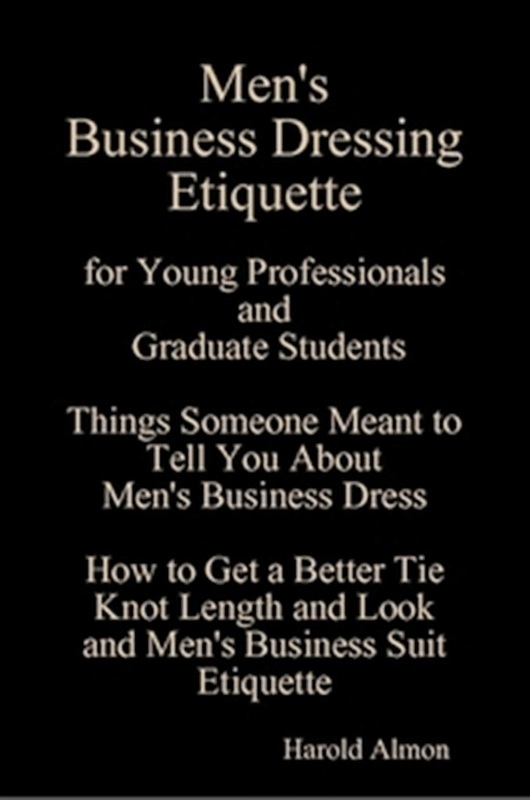 Your dress is the second thing someone will see, when a decision is made to associate with you or with your company. You, your product, and your company are perceived and approved of by your adherence to your company's dress code. Maintain an approved wardrobe for the "Company" in which you want to work. Know and accept that it is in the total package in which someone will be interested. The difference between "Baby oil" and Mineral oil for the most part is the packaging. 7. A dress code, and your adherence to it, can very well be a condition of your employment. Remember you can always apologize for being overdressed. Have at least one dark suit for business-work day and one sport jacket or blazer for business-social day or night. You are to own formal evening-clothing. You can start in parts. If you are going to piss money away on something, you may always rent the beer. 1. In-between a "Stepford husband and the Thing." 2. Socially, you may wish to buy a pair of black jeans: the right cut for your rear, and maybe some boots. 3. Each item of clothing you have is to fit, feel good, and is to be kept in good repair. 4. Get a good tailor, “He or she can do as much for your physique as a good personal trainer." A tailor that is not good can constrict your chances at advancement. 5. Prepare your clothing the evening before you need them. 7. In between Memorial Day and Labor Day you can wear shirts made of silk (or a silk/rayon blend) madras, linen or linen and rayon blend, pants made of seersucker, and jackets made of silks, white wool, or tropical summer weight wool, and shoes called white bucks. After this season, these items are to be packed away. The exception to the rule is when you are going to be out West. The rule is "Dress for fitting in." 1. Dress in a style similar to that followed by people in the job or association of which you wish to become a member. You can be a bit dressier, but you are to be seen as fitting in. Clothing is called a wardrobe because in a word and a world it allows you to fit. 2. Pick a signature color. Dress in it. This may be done in the extreme. There is the man in white and the man in black. These people are contractors. I would say pick two. You would then want to add black and white. That makes four. You can add an accent color. It may change with each season. It is to appear no more than once on each outfit. Allow two more required colors for festive days…. 1. 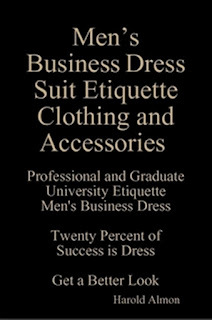 A name tag is the number one accessory in male business dress. It can say, "Hello," "Let's talk," or "Let's do business." A name badge is to be used to help others know you by your name. It can be used to facilitate an introduction. When a name badge contains a name only, it is to be placed high on the right lapel, just below the shoulder bone, or attached to or just below the shirt collar. It is to be placed up high next to a left lapel, when it contains the name of a company and a person. It can be pinned to a jacket or a shirt. It may have a piece of cardboard, or a magnet, placed behind it. 3. Get a tailor. Either can do better for your image than any suit. Make sure he or she follows the rules. 4. Get a small Swiss Army Knife. Strings are to be cut off clothing used in a business life. 5. Get a clothes brush. 6. Hair is to be scissors cut. 7. Get eyeglasses that are connected to your social status, even when you wear them in your hair or breast pocket. In business, avoid wearing eyewear that looks like sunglasses, unless medically directed. Eyewear can be conservative and fashionable. Each piece may be in a signature or company color or frame. Eyeglasses are to be washed. Water and soap can be used to do this. Each is to be wiped using a fabric cloth. Glasses can be taken to an optician. He or she will usually clean and adjust them for free. 8. A lapel pin is to be placed on the left lapel of a jacket. It is to be company or community related. 9. A breast pocket wallet or a day planner is to be acquired. Hip wallets are to be avoided; or worn in a front pocket. Avoid being injured by your wallet, sitting on the picture of a loved one, or sitting on a business card of a friend. 10. Get platinum or a gold American Express card. You can get a green one, if you must. Master your accessories; these are 10 of 31. Be at Ease. Get good shoes. Get 1 pair of plain black cap-toe oxford lace ups: in calfskin when you can. You can elect to get two pairs of black shoes when this is new to you. You may get 1 pair of wing tips. They could be in chestnut brown. Have at minimum of two pair of shoes. Wear a different pair each day. Between wearing shoes need a day off. 1. Have shoes that tie. Have some leather soles to go with your laces. Wear shoes that are approved for your planned company. 2. For work, wear shoes made in the United States of America, or England. For night, you can wear a pair of slip-ons made in Italy. For now, learn about high-end shoes that begin with the name Salvador, Cole, Johnson, and Nor. Include an Allen. Have shoes which may be sent back to the manufacturer every year or so for servicing. Know the maker and the model name of the shoes you are wearing. Avoid spending your whole life in shoes that ends in ‘Adams” or "Sheims." Later, learn about handmade shoes. Enjoy your life. Informally you may wear conservative loafers. 3. Avoid matching shoes and socks, except with black pants or with an evening suit. 4. For formal events shoes may be black pumps (with flat grosgrain bows) made of patent leather or suede. Avoid wearing either of these with a business suit. 5. Being well heeled is to be evident by the condition of the heels of your shoes as you are walking away. Place your shoe in the palm of your hand and spin it around. Like or correct what you see. Wear your event shoes often prior to an event. You can have a rubber tab placed on the heel of each shoe. Put your shoes on using a shoehorn. 6. Clean and care for your shoes You may have run down soles repaired, heels replaced, and unshined shoes polished locally. When the shoetree begins to look better than your repaired shoes, get new shoes. 7. Store your shoes on a shelf with a "wooden" shoetree placed in each, in the cloth bag in which each came, and/or with the heels facing you. They are used as a criterion in any daily acceptance process. 8. Newspaper can be placed inside each shoe to assist in keeping insides dry.You are walking and I can hear you. And if I do, time to learn a new way of walking or to get new shoes. If you are walking with someone and the only one you can hear walking is you: if you cannot hear the other person with you walking, and the person is a friend, you can ask, “How do you do that?” Listen and practice. I call silent walking Gazelle walking; walking on the balls of your feet. Your body will teach you how. You still have to practice and listen. And no, the answer is not wearing shoe with rubber soles. Get some high end sandals. Have shoes for your sports life. Get sneakers, a pair of "Air" this, or with a symbol which means, "Just do" that, or ones that provide "New" balance. Have shoes for your sports life. Get sneakers, a pair of "Air" this, or with a symbol which means, "Just do" that, or ones that provide "New" balance. Learn names like fendi, locoste, puma, polo, and addias. These can be male “business” day shoes for the alpha young. Any spot can be defended in flip flops. It is hard to climb in them. First get some high end shoes. Interviews still require well heeled shoes. Get business ties. Get 1 tie in navy, and one in a signature color. Then get 1 in plain black. 2. In business, wear a tie that has a pattern: (old school:) regimental stripes, club, Ivy League, paisley, or a plaid print. Spend enough time in a good tie shop to learn the look of each. (New School:) look around your office setting. In some businesses, you can pick and wear a tie to reflect your personality. Follow the lead of senior people in your environment. Welcome to a new day. 3. Practice looking at labels and feeling ties. Learn to distinguish characteristics in each with your fingertips. Ensure that your tie has a bar tac. That is a stitch behind the large end used to keep the small one in place. 4. Ties are to have a separate lining. Each tie can have a string that runs from tip to tip. Check by pulling this string and seeing it draw up. 5. A regular tie is to be 57” long - American. It can be 58” long - European. A custom tie may have up to an additional 5 inches, but why? Each tie can be 3-4 inches wide at the widest part. Each may be no wider than the lapels of the jacket to be worn with it. Know how many folds are in each tie, and where each can be cleaned, altered or custom made, without being creased: Tiecrafters, in New York City. 6. When buying a tie take or buy the jacket that will be worn with it. The tie is to have highlights or some hidden color evident in each of the jackets to be worn with it. Each tie is to be darker than, and complement, the shirts to be worn with it. Avoid matching a shirt to a tie too closely. 7. You can pick several shirts out at the time you select each tie. Place a tie on each – step back fifteen feet; take a look, each is to be a happy match or put back. In social life, you may wear any tie your special someone picked. Share things your partner is to know about a tie. It is to be made of silk, a featherweight foulard silk, a heavier regular weave silk, or a silk and polyester blend. It can be made of wool: lightweight Challis wool, coarser woven wool, or a blend. A tie can be bought off the peg or be custom made. 1. Center your tie knot and dimple with the "V" in the collar of your shirt. 2. Pull down the back of your shirt collar. Cover any exposed part of the tie. Check in the mirror, look at the back. 3. Angle the bottom of the knot upward towards the chin. 4. When a tie is long enough, and is tied correctly, the edges of the angles at the side are to be even. Both ends are to come just to the top of your belt. A tie which is too short may still be used. Start with the smaller end of the tie a little higher up on your shirt. Then you can raise the end of the tie in 1/2-inch increments. Tie your tie up high in the corridor of your collar. Cinch each wrap high up on your tie. Tie a different knot. A tie is to be the right length. Find the length that correctly fits you. Share this information with your special someone. Test tying the tie in the store. Practice using the knot that you will use most frequently with the tie being considered. Most ties will fit differently depending on the tie knot. Do this before the tie becomes your property. You can wear a tie clip. Avoid wearing a tie tack except when wearing an ascot with formal morning clothing. In public, avoid wearing a long tie that has been loosened. It is better to open and remove it completely. Pull it apart from the opposite side in which it was tied. Remove the knot from your tie right after you remove it from your neck. Store each on rack, peg, or over a towel-covered hanger. If you’re wearing a tie, avoid throwing the tips over your shoulder. A tie is to be steamed and or hand pressed and hung so as to never know or show a crease. 2. Look at a suit from Brook's brothers No.2 in navy or gray. 3. OK now go to the Warehouse, and make a stop at JoS. In business, a suit is at the top of the "Dressed" list. This is true, even when all that it is is a uniform. At a certain level, this uniform is what someone expects to see. To people at the top "A Suit" can be a person who wears a bad suit, or an incorrectly tailored suit, or the same suit every day." Avoid aspiring to be this person. Being a suit and being well suited is not the same. Each suit is to be conservative and uniform. A suit is to be made of all season mid-weight cloths. Each can be made of fine silk or Super X00s, or weightless vicuña blends, but who will care for them? Unless cared for each garment could announce, “The wearer is not yet ready.” A hand sewn single stitch thread suit can be smooth and pucker free and more resilient to stretching than the machine sewn cross stitch variety. By the time this matters you will be making a lot more money. 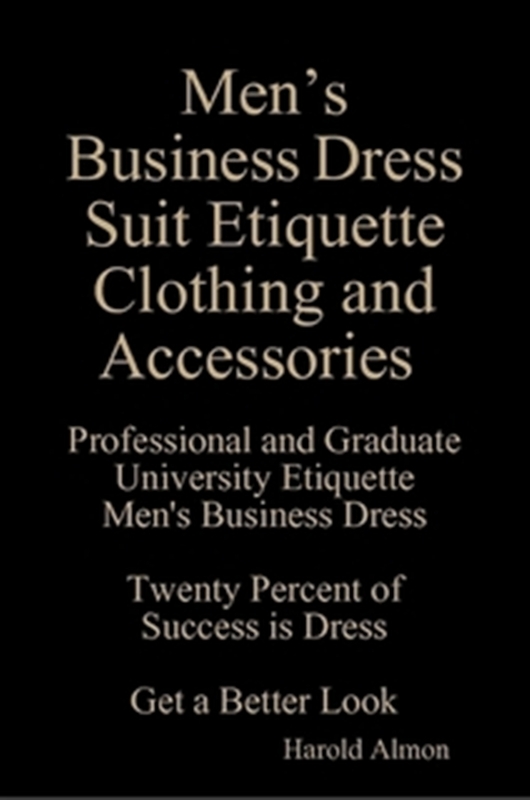 Wear the best quality upper body clothing that you can within your income bracket. Be aware of the competition. 2. In business a sweater is to have a V-neck. In social day life, you can learn about crew neck sweaters. Have the top of any shirt collar pop up and behind the neck of one. In social nightlife, you may again learn the value of a V-neck. The ultimate in casual wear is a well-made sweater. (Remember Bill.) Even a young man is to own one. 2. Have sleeves long enough so that no other material shows below them. 3. It is to have a single vent in the back. 4. And it is to be no higher than the jacket or the suit worn beneath it. 5. A long overcoat is to be no longer than six to eight inches below knee length. 6. A short overcoat can provide the length requirement, a more casual look, and still be short enough to wear with denim. Learn about topcoats that have the same name as your suits. You can learn about an overcoat by Crombie and a Trench coat by Burberry. Casually, you can learn about rebel leather. A discussion on hats has been omitted here. One has not been seen on a businessman or politician from the USA since before Kennedy. It is still OK to wear a scarf. Socially you can grab and wear a hat. Men's Business Dress Accessories is designed to denote options in dress enhancements. It covers things that let a man stand out from the crowd. Accessories are to be used to allow a man to be fully dressed in the uniform of the day, add architectural details to a well-framed wardrobe, and silently emphasize individual style. It may be distinctive touches of finishing accessories that make the difference in being accepted and respected. They could provide accent marks that allow a person to pause and to look at your personality. People react to accessories. They aid in the performance of displaying a well-dressed image. To some one the operational level the number one accessory in male dress is a name tag. 2. The ultimate accessory can be a thirty-four inch waist. You can be your own personal trainer or hire one. 3. Get a good tailor. “Either can do better for your image than any suit.” A tailor that is not good can make you look like you are where you do not belong. 5. You can get a clothes brush. 7. Eyeglasses are connected to social status, even when you wear them in your hair, breast pocket, or atop a button center your shirt. In business, avoid wearing eyewear that looks like sunglasses, unless medically directed. Eyewear can be conservative and fashionable. Each piece may be in a signature or company color or frame. Eyeglasses are to be washed. Water and soap can be used to do this. Each is to be wiped using a fabric cloth. Glasses can be taken to an optician. He or she will usually clean and adjust them free. 8. A lapel pin can be placed on the left lapel of a jacket. It is to be country, company or community related. 9. A breast pocket wallet or a day planner is to be acquired. This can be the closet a man is to come to owning a (man purse) murse. Hip wallets are to be avoided; or worn in a front pocket. Avoid being injured by your wallet, sitting on the picture of a loved one, or sitting on a business card of a friend. 10. Get platinum or gold American Express card. You can get a green one, if you must. 11. In business, have a business card holder. Learn to open and close one, silently, using just one hand. A holder can be a license case, or a wallet; avoid any that looks like a shrine. 12. Get a Smart Telephone. Get a cellular telephone. The two can be one and the same. Each is connected to a social class. In old school, you were to strive to eliminate VTL (visible telephone line); now some people look for your ultimate cover or case. You may play at talking small, and pretending that it does not matter, as long as your telephone is equipped with voice mail, tri-mode, and lock out code capability, and has an ICE (In Case of an Emergency) contact number. Learn to use your telephone with your left hand, elbows down and in. 13. Have a signature candy, cracker, or cookie. It can contain Cinnamon, mint, or flavor of your choosing. Give it away freely. Ensure it is good enough for people to remember and to want often. 14. Get metal writing instruments (a pen and pencil set,) the more metal in each, the better. Each is to be engraved on the side, in the space set aside for it. It can be done locally, or have it done back at the company that made it. Get and learn how to use a fountain pen. It can be made of plastic. 15. Writing instruments are to be engraved in script, block, or double block in Gothic, with a first and last name, or with initials. This will give credence to someone saying that each was obtained as a present. 16. Get a soft briefcase. An envelope can serve as a briefcase. A briefcase may be an expanding file made of reddish brown fibers. It could be a Mark Cross leather case, or a Mark Cross look-a-like. It is to be thin and look used. It could be in the same color and texture as a belt. Carry a briefcase to the left. A messenger bag can be carried over the right shoulder. 17. Have a soft laptop case, backpack, or side satchel. Be careful about carrying any two at the same physical level. Avoid carrying a back pack below your lower back (and causing one to have to rename it.) A short person can avoid carrying a large satchel or one that is too low. Get a lap top computer when you can. Use a 7.75 X 5 coil bound note pad in a day planner, until you can afford one, or a 6 X4 spiral notebook. 18. Keep a soft travel bag packed. One for the day you say, "I am never coming back." Equip it with a sewing kit to reattach buttons that may come off along your way. 19. Get and use a metal money clip, and a leather, or cloth, coin holder. Paper money can be washed, dried, and ironed. Coins may be washed and shined. One man I know, and one major Hotel, I hope, still does this. The act is impressive. 20. Carry a newspaper. Socially, carry a book. I called it the Harriet Tubman effect: have someone look at and think less of you and make him or her take it back. It could assist in staying informed, mentoring someone, your staying free, and in changing your life’s quality. 21. You may get a necklace. It is to be gold, and discreet. Socially, it can be of rope or shells for the young. 22. Have a pocket timepiece. It can be worn after work and with formal clothes. It may be worn every day, socially. Learn to open it, and to close it, silently, using just one hand. 23. Get a wrist timepiece for business. Get a Rolex® sport (a Submariner.) It is immediate negotiable currency. You can get a Timex Iron man Triathalon®. Welcome to the club. When you are ready to be reborn you may get a Brietling®; it could be the bottom of the level that is next. You may inherit a Patek Philippe®. There are different levels of work: Tiffany & Co.
Own a timepiece equal in value to those worn by your peers or immediate superiors. Insure it. Protect it. Have it serviced once a year. It is to work or avoid wearing it. It is used as a cultural totem. Have one you want to pass up to a son. 24. Wear one "I like me ring," in a signature setting. You can wear your marriage band, on your left hand. You may wear a signature ring on your right hand. You could carry a class ring, but show it only in a place where you would show a passport. A necklace, a timepiece, and a ring, when three are worn, only two are to be seen. The metal in each can be cleaned with 91% alcohol. So can keys. For outside the only other thing to shine may be really cool sunglasses. 25. In business, wear a signature gold bracelet only when you can do so without prompting a personnel investigation. 26. Get conversational cufflinks and/or button covers. Get a lighter for things flame worthy. As an accessory, jewelry for a man can be limited; a man is judged based on the size of the jewelry on his special someone's hand. 27. In the United States of America, in business, avoid wearing a hat. In social life, an accessory item is to be sporty. A baseball cap is to have an allegiance symbol on it. A cowboy hat can be known by a cut. 28. A tee shirt may be worn and can be printed on to reflect allegiance to an institution of sport and/or an event. Learn the rules for markings. Get a jacket, some gloves, a scarf, and an umbrella. 29. You can add an IPOD to your business dress accessories. A man can walk to the beat of different drummers. Place the Y of the speaker wires behind your head, until the advent of Bluetooth; avoid looking like you want to be lead. You can be micro phoned from the front under a shirt, and use only one part of the y for an earpiece. Avoid locking a potential sponsor or contact out of your life. 30. A piercing is a hole for an accessory. No more than two piercings are to be for one ear. Facial piercings are to be avoided; they can inhibit chances at real employment. 31. A tattoo is a present to oneself. Each is to be placed discretely. What is art to one person is a “Whoe” tag or a “Tramp stamp” to someone else. I did not invent the vocabulary. You have a right to wear most anything. There is a line between your being free, demeaning, and proselytizing. The more they can envy you, the quicker they may release you.